Organic mulches were applied to two avocado and two citrus orchards over a four year period. Soil moisture, weed suppression, tree canopy, root growth, soil/leaf nutrient status and fungal populations were measured. There was a pronounced effect of mulches on soil moisture (reduced evaporative loss) and weed growth (substantially reduced with mulch) , but plant canopy and leaf nutrient status changes were negligible during the time frame, although soil nutritional changes were noted. An important effect of mulches on root architecture was an increase in root length and spatial distribution in avocado, which was not found in citrus. This change in rooting pattern may partially be responsible for improved disease resistance in avocado. Citrus, with a value of more than US$600 million and avocados, with a value of more than US$240 million annually, are among the 10 top most valuable commodities grown in California. In 1990, a law came into force which mandated the redirection of landscape trimmings from land fills to more beneficial use. The subtropical tree crops industry has been viewed as a potential user of mulch derived from diverted landscape materials. These crops have been targeted because of the relatively high value of the crop being able to pay for the hauling and spreading of the materials. The effects of yard trimmings as mulches have been shown to be highly beneficial to growth and production of numerous crops. The effects have ranged from reduced water use (Opitz, 1974), improved water infiltration (Gregoriou and Rajkumar, 1984; Jones, 1961), reduced weed growth (Lanini, 1988), increased soil fertility (Weeks, 1945), control of soil-borne diseases (Hoitink, 1991) along with myriad other effects (McNees, 1916). Avocado trees in particular may benefit from mulches since they are prone to a devastating disease caused by Phytophthora cinnamomi – avocado root rot. This is a disease that is enhanced by soil and management conditions that exacerbate water logging. This disease affects about 75% of the California plantations. Citrus is also affected by 2 species of Phytophthora which, although not as debilitating as avocado root rot, affects nearly 100% of the citrus groves of Southern California. The purpose of this project was to evaluate the effects of mulch on the growth of citrus and avocado and its effect on the respective soil fungal pathogens of these tree species. The trial consisted of two lemon citrus orchards and two avocado orchards in coastal Ventura County, 150 km north of Los Angeles. Pommer Ranch consisted of 3 year-old ‘Eureka’ lemons on ‘Macrophylla’ rootstock planted on a sandy loam, 3 km from the coast. Twenty replicate trees received either a 2.5 cm layer of mulch, 7.5 or 15 cm initially and each year material was reapplied to the original depth. Twenty trees received no mulch. The mulched trees were treated annually with a raw yard trimming from 1994-98. Mulch was spread under the tree canopy out to the drip line and also down the rows as a strip, mulch was kept away from the trunks. The trial was irrigated by drip irrigation and the treatments were randomized in 5 blocks (4 trees/treatment/block). A second citrus orchard (Essick Ranch) was laid out in a similar fashion. The trees were ‘Navel’ orange on ‘Troyer’ rootstock. The soil was a loam soil irrigated by microsprinkler. This site was at a higher elevation (800 m) than the Pommer site and was both colder in winter and hotter in summer than the Pommer site. At both sites, Phytophthora citrophthora and P. parasitica were present in the soil. The avocado sites were both on clay loam soils and irrigated via microsprinkler. The Vanoni site consisted of ‘Hass’ on either ‘Duke 7’, ‘Thomas’ or ‘Toro Canyon’ rootstocks. Sixteen trees of each rootstock, randomized within the orchard, were treated with either no mulch or a freshly ground Eucalyptus globulus mulch. Each tree received 1/3 cubic meter of mulch and the amount was renewed annually the following 3 years to maintain a 15 cm depth. The Sprinkling avocado trial was similar other than using a mixed yard trimmings mulch and consisted of ‘Duke 7’, ‘Thomas’ and ‘UC2011’ rootstocks. At both sites, Phytophthora cinnamomi was present. Both sites were 20 km from the coast at 150 m elevation. At all four sites, trees were evaluated for vegetative growth, tree appearance, fruit yield, leaf/soil nutrients on an annual basis, root growth, Phytophthora sp. populations, soil water, and weed suppression. Vegetative growth was measured by trunk and canopy circumferences. Tree appearance was on a relative scale of 0 to 5, with 5 being a dead tree. Root length was measured with the Newman technique (Newman, 1966). Phytophthora numbers were measured by the most probable number (MPN) technique (Alexander, 1982). Soil moisture tension was measured with tensiometers (Irrometer Co., Riverside, CA, USA) at two soils depths (0.2 and 1 m) with stations in each replicate plot. Weed densities were measured monthly by counting weed numbers in a 1 square meter grid tossed randomly on to each replicate plot. Statistics were performed with StatView (SAS Institute, Cary, NC, USA). The most pronounced immediate effects of the mulch are demonstrated at the Pommer and Essick citrus plots. Figure 1 demonstrates the reduced evaporative loss from plots that have received mulch. 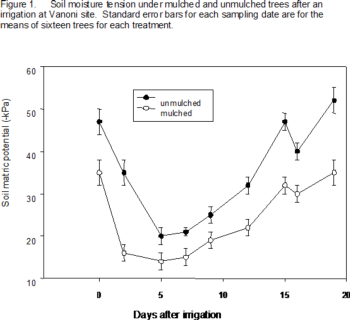 Soil moisture tension was consistently higher in unmulched plots at all trial sites. This difference required growers to make adjustments to their irrigation schedules to accommodate the higher soil moisture contents that could be conducive to root rots. 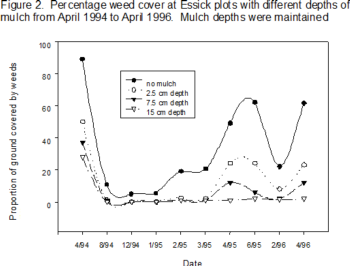 The other immediate effect was reduced weed populations in the mulched plots (Figure 2). A 15 cm mulch depth resulted in the greatest reduction in weeds, but even the 2.5 cm depth had some effect. At all sites there was a difference in soil nutritional levels between mulch treatments and controls (Table 1), after four years of mulch applications. However, even in the most pronounced example of a difference in soil nutritional levels at the Vanoni avocado site, there were not markedly different leaf nutritional levels (Table 1). There were slight but significantly lower levels in N, P, K, Mg, Zn, and higher pH in soils with no mulch, but these soil changes had only a moderate effect on a lower leaf Zn. At three of the sites, there was no difference in canopy volume in either lemon, orange or avocado trees (Table 2). At the Sprinkling avocado site there was a change in canopy volume and this was influenced by the rootstock (Table 3). ‘Duke 7‘ is a clonal rootstock which has moderate resistance to root rot, whereas ‘UC2011’ and ‘Thomas’ have some of the greatest resistance to root rot of all the selections in the UC Riverside breeding program. All of the mulched rootstocks had an improved visual rating (Table 3), but the ‘Duke 7’ had the greatest growth response. The more pronounced growth of ‘Hass’ on ‘Duke 7’ is thought to be partially a result of a change in root architecture. At both avocado sites there was an increase in root length resulting from the mulch (Table 4). This was not the case at the two citrus sites. In the case of both avocado sites, roots were found growing in the mulched volume. On closer examination of avocado root length, root infection and Phytophthora populations at the Sprinkling site, it became apparent that the root distribution had changed, such that the roots had grown out of the soil into the better aerated mulch environment (Table 5). This environment had lower fungal pathogen numbers and lowest incidence of diseased roots (Table 5). Ongoing research is evaluating the disease suppression of mulches, but there is clearly a physical effect of mulches on root architecture, as well as other soil physical effects such as soil moisture. The long-term nutritional and biological effects may also be important, but as can be seen in this trial, they are not significant on these soils in this environment during the time frame of this trial. Alexander, M. 1982. Most probable number method for microbial populations. pp. 815-820. in: Methods of Soil Analysis, Part 2, Chemical and Microbiological Properties, 2nd Ed. A.L. Page ed. American Society of Agronomy, Madison, W I.
Gregoriou, C. and D. Rajkumar. 1984. Effects of irrigation and mulching on shoot and root growth of avocado (Persea americana Mill.) and mango (Mangifera indica L.). J. Hort Sci. 59(1): 109-117. Hoitink, H.A., Y. Inbar and M.J. Boehm. 1991. Status of compost-amended potting mixes naturally suppressive to soilborne diseases of floricultural crops. Plant Disease 75(9): 869-873. Jones, W., C.B. Cree and T.W. Embleton. 1961. Some effects of nitrogen sources and cultural practices on water intake by soil in a Washington navel orange orchard and on fruit production, size and quality. Proc. Amer. Soc Hort. Sci. 77:146-154. Lanini, W.T., J.M. Shribbs and C.E. Elmore. 1988. Orchard floor mulching trials in the USA. Le Fruit Belg. 56(3): 228-249. McNees, R. 1916. Mulching experiment. Calif. Citrograph 1:1-10. Newman, E.I. 1966. A method of estimating the total length of root in a sample. J. Appl. Ecol. 3: 139-145. Weeks, W.D., C.T. Smith and M. Drake. 1950. Residual effects of heavy mulching in a bearing apple orchard on soil nutrients. Proc. Amer. Soc. Hort. Sci. 56:1-4. Table 2. Effect of mulches on canopy volume (cubic meters) after 4 years of mulching. *Mean values followed by identical letters are not statistically different according to Waller's k-ratio test. rootstocks after 4 years of mulching at Sprinkling. *mean values in each column followed by identical letters are not statistically different according to Waller's k-test. various soil depths at Sprinkling site. ANOVA and LSD (P<0.05) using 5 replications of mulched and unmulched tree pairs.